I'm entering a week where I'll have to put in overtime because I have a project due at the end of the month. I'm so close to having it done but it's a lot of busy work and can be tedious. The overtime is good for the bottom line but it does cut into the time I would spend doing things at home. Plus, I come home rather mentally tired. So today, I decided to finish that last leaf at the upper right. This side of the piece is officially done as far as the leaf stitching. 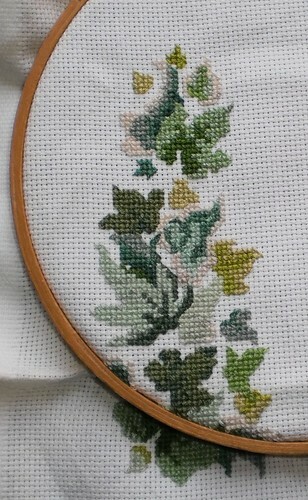 There's the outlining left to do but I'm not going to do that until the leaves are all stitched. I have 14 leaves of varying sizes left to do and I'm finished with leaves. It's probably 7-10 "days" of stitching left. Depending upon the size of the leaf, I can do 2 or 3 a sitting. I'm quite pleased with how this has developed. I hope the recipient likes it, too.